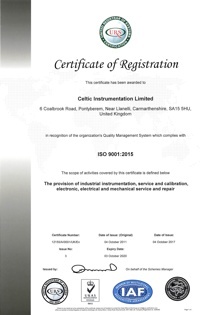 Celtic Instrumentation Ltd provides a Nationwide on-site calibration and certification service to the engineering sector. All certification work is undertaken in accordance with our ISO 9001:2015 quality management system. All of the site calibration equipment we use carry UKAS traceable documentation from high accuracy selected laboratories. We are able to provide on-site calibration of digital and analogue instrumentation as used on heat treatment furnaces, cleaning and chemical baths, environmental (effluent) instrumentation etc. Our service vehicle is equipped with traceable pH, conductivity and turbidity standards for site environmental testing. All of our liquid analysis fluids and standards conform to N.I.S.T. standards and carry internationally recognised documentation of conformance. We can source and supply most types of industrial measuring sensors that includes high and low temperature thermocouples, PT100 / Thermistor sensors and high precision digital thermometers. Our service vehicle is also routinely equipped with specialist cables and accessories for on-site repairs.